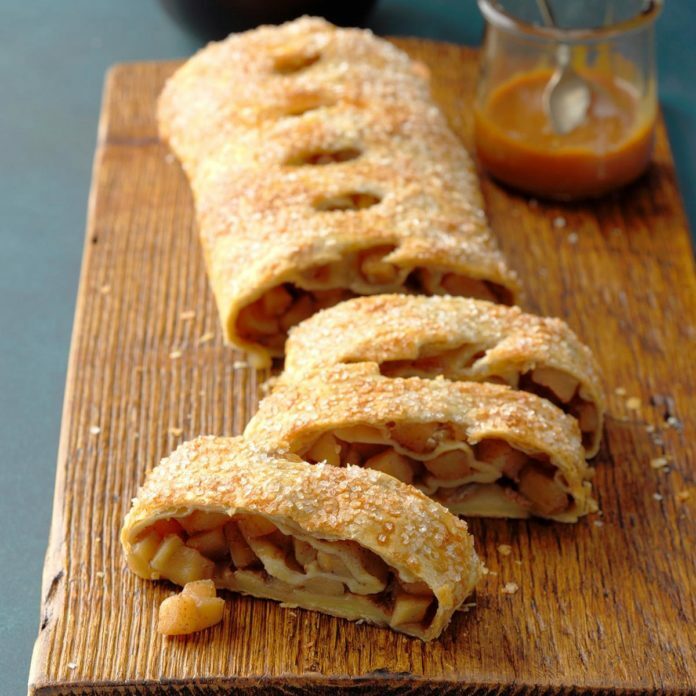 Today, it is easy to make great apple strudel at home! The time-consuming part of the job is making the puff pastry, but now, really good frozen puff pastry dough is available nationally. It wasn’t available in my Aunt Johanna’s time. I recommend Trader Joe’s all butter puff pastry or Dufour puff pastry. I don’t recommend Pepperidge Farms puff pastry, which unfortunately is the only brand that most supermarkets carry. It contains no butter and is made with palm oil and corn syrup. Yuck. Pepperidge Farms puff pastry looks buttery, but that is because there’s yellow food coloring in it. Selecting the right kind of apples is still very important. My first choice is Granny Smith. They retain some firmness when baked, and they are tart, which offsets the sugar in the strudel. If you want a somewhat sweeter apple that bakes well, try Golden Delicious. Strudel doesn’t have to be made with apples. It can be made with other kinds of fruit as well, including pears, cherries, and blueberries. Whatever kind of fruit you use, always make sure that the fruit is fresh and top quality.